A nod indicated that they were. Couldn’t have guessed from either the exterior signage or the lack of lights on inside, though it was 12:30 and we’ve come to believe lunch is the ideal time to dine at Somali restaurants. We seated ourselves in the basic but clean dining room and were served complimentary mango juice and bottled water. Inspecting the menu revealed a relatively modest assortment of the usual suspects… plus a few new to us. We asked about some of the unfamiliar items. …which brings us to the default approach we’ve come to fall back on at Somali restaurants – just ask ‘whatcha cooking today?’. After a brief discussion with our server, we settled on goat with rice, KK, and their recommendation for a substitution on a chapatti-based menu item (we weren’t told the dish’s name). The ‘dish with no name’ came out first – a nicely seasoned chicken dish with onions, green beans, sweetcorn and peas in a mild curry-like sauce. It came with chapatti strips (which we used to pinch morsels from the chicken dish), iceberg lettuce, and lemon wedges. The chapatti was a bit on the tough side, but the chicken was roundly appreciated. 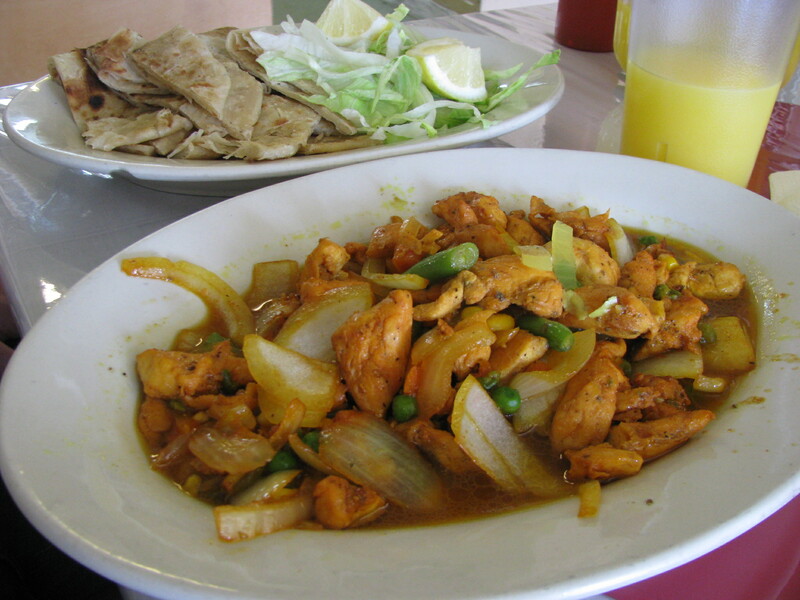 Next we tried the KK (chapatti strips cooked with chicken and vegetables). This was more like Banadir’s (curry-esque) than Calanley’s (tomatoey), but less well received than either – just a bit too mild, and slightly on the gluey side. The goat was good in varying degrees – from bite to bite, it could be anywhere between ‘eh, not bad’, and ‘damn that’s a thing of beauty!’. When it shined, it was a tender piece with plenty of the exceptional curry flavor. 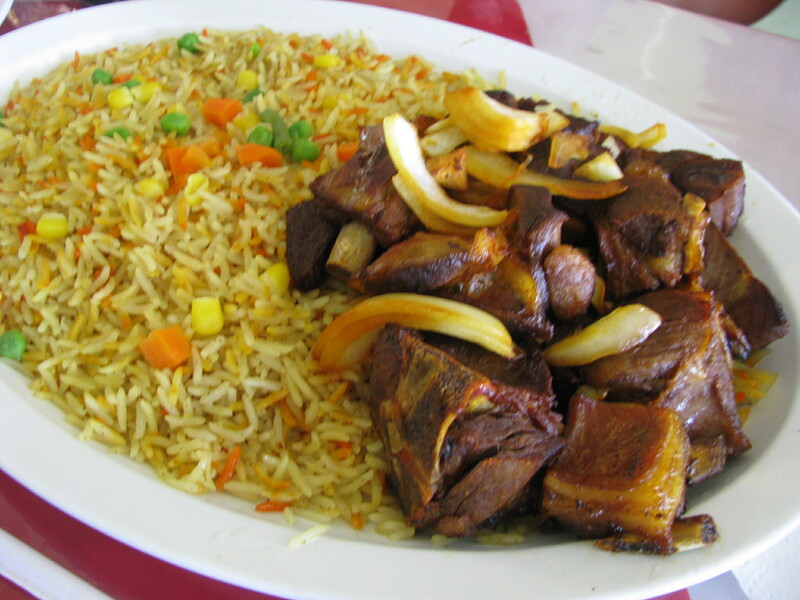 The meat was bone-in, topped with sauteed onions and plated with a generous portion of a nice basmati rice. As we went up to the register near the kitchen to pay, we looked back upon a much-changed dining room. Lights were on, people were everywhere. It would appear as though their unofficial opening time was somewhere around 1:00pm. 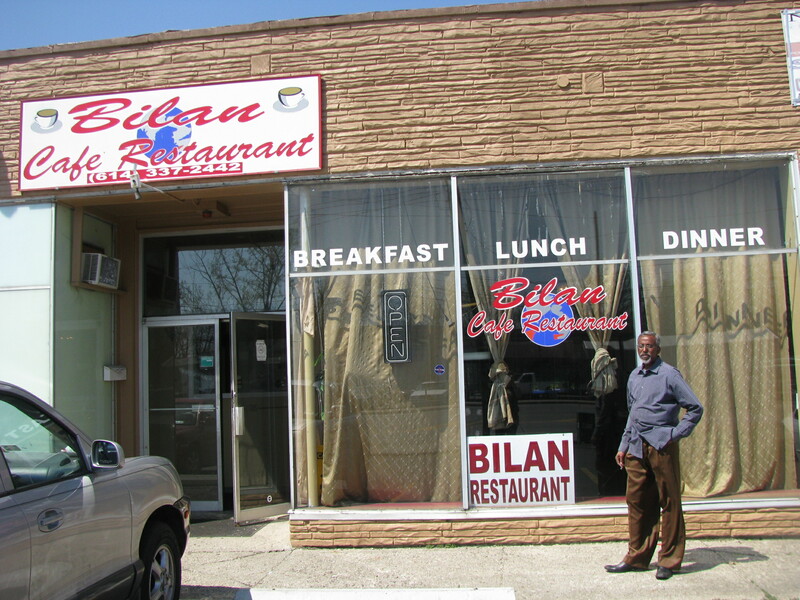 Bilan’s service is friendly, if perhaps a bit slow. 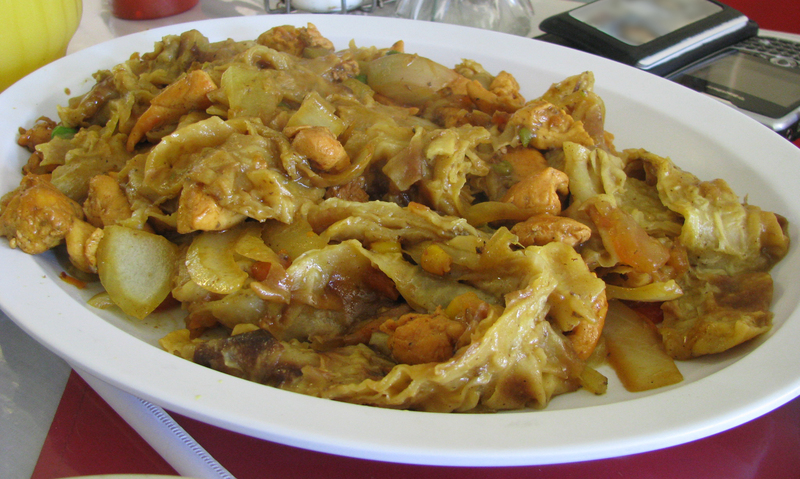 As with most Somali restaurants, there appear to be few vegetarian-oriented dishes. Note – chapati, jabati, chapatti… ? Transliteration would appear to be an inexact art, especially when dealing with the less well established cuisines. In this blog, all italicized words are copied straight from the menu of the restaurant being reviewed. This entry was posted in Restaurant, Somali and tagged chapatti, goat, kk. Bookmark the permalink. Absolutely love the blog. As a world traveler, I try to eat at as many international restaurants as I can, even at home. This site is a fantastic resource; I’m bookmarking the feed and sending the info onto friends!